I noticed the hit counter on the blog broke 1000 views this past Friday, and to celebrate I am posting one of my favourite photos. For the past few years I have headed out with my oldest friend, James, and his Dad, Jack, for a cross country skiing trip up by their cottage North of Kingston, ON. We’ve known each other for . . . actually, it will be 25 years in January! . . . and we always have a good time together. This past year there was almost no snow to speak of, so we broke out the ice skates and basically played pond hockey for about 3 days straight. The weather was amazing—clear skies and bright sun all the time. I only had my Kodak point-and-shoot with me, but that little workhorse produced some great images. This is my favourite from the weekend. 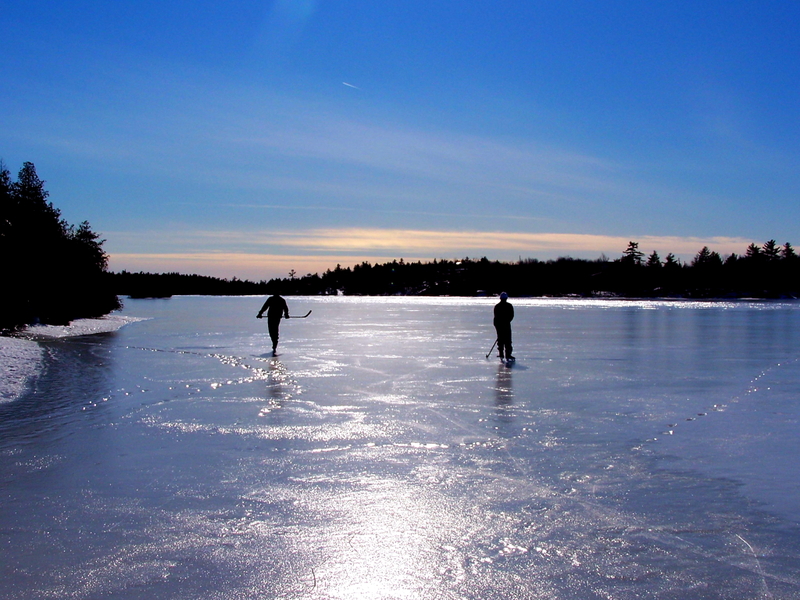 Father and son passing the puck back and forth along a huge lake, as has been done for so many years. Just us and the ice—poetry in motion. I can’t wait for this year’s trip! I just love how there is always something to photograph. I also love how some of the most meaningful photos are often ones taken with family and friends, with no more purpose than to capture a moment or a memory. Great job Mike, I am enjoying your work. Oh, thanks to everyone for not wearing a Leafs jersey, lol. Right there with you on the Leafs jerseys Lee – I am a Habs fan myself! You’re absolutely right, many of the most meaningful photos I have taken have a strong friends and family component to them. I think the deep emotional connections help me to bring out the feeling of a scene so much better. The images take on deeper significance because I really care about the subjects.